ComplianceOnline and subject matter expert, Andrew Campbell will conduct a Seminar on quality oversight of pharmaceutical contract manufacturing organizations. PALO ALTO, CALIFORNIA, UNITED STATES, March 28, 2019 /EINPresswire.com/ — Led by well-known Pharmaceutical Consultant Andrew Campbell, ComplianceOnline’s popular seminar on quality oversight of CMOs comes to Florida in 2019. 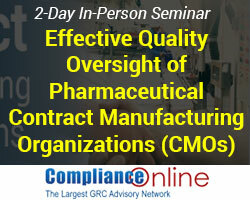 This training program will address regulatory requirements for CMO quality oversight and will help attendees understand the CMO business model. Given the constant updates in the industry, each session in the seminar will cover these industry updates and focus on best practices on how to manage CMOs on an ongoing basis. The training will focus on the topics such as selection and qualification of CMOs, development of quality agreements, understand CMO operations, and review of key CMO records and others. Seminar instructor Andrew Campbell has over 25 years of pharmaceutical quality assurance and quality systems experience in both industry and consulting roles. Mr. Campbell has worked in clinical supply and commercial manufacturing environments, and has experience with integrated manufacturing and contract manufacturing business models. He has extensive expertise in the areas of deviation – CAPA, change control, GMP auditing, GMP training, and regulatory inspection preparation and management.